A SPATE of UFO sightings is giving a British county a new name for itself – being one of the best places to spot an “alien”. The belief that aliens really are visiting Earth is strong in the West Midlands, where regional media have reported an upsurge in sightings. 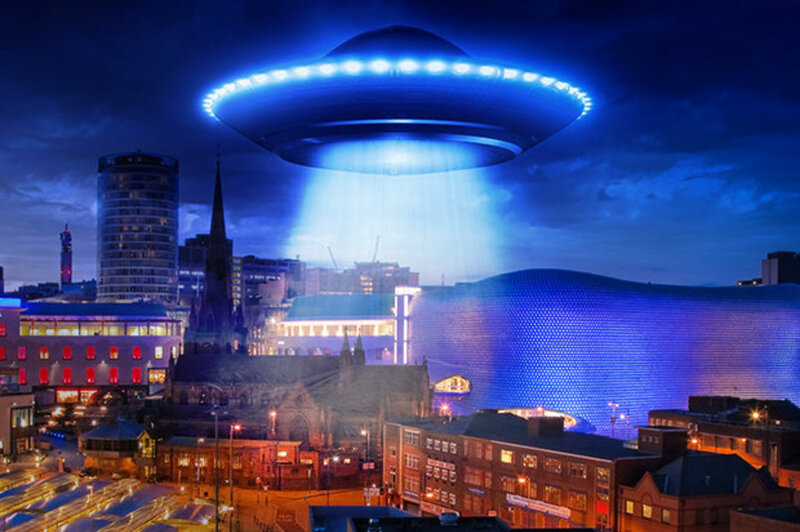 A local newspaper reports that there has been 13 UFO sightings in the past four years, including four in the UK’s second biggest city Birmingham. Ten of the alerts involve objects seen in the sky, mostly at night, while the other three reported seeing lights. Four of the 13 calls came from Birmingham, and the rest from Sandwell, Coventry, Dudley, Solihull and Walsall. One sighting came in January 2015, when a mum from Selly Oak, near Birmingham, rushed into her three-year-old son’s bedroom to find him screaming “spaceman” repeatedly. She recalls that when later shown a picture of an alien with grey skin, a bulbous head and large eyes – known by researchers as a Grey – her son immediately repeated the same word and began crying. There have been numerous sightings of a triangle-shaped UFO have been reported over Dudley, the Mail adds. Its most recent appearance was in Quarry Bank in 2011, when a man smoking in his garden saw a mysterious object with flashing lights – which was then chased away by another strange craft. The object has also been spotted hovering over Dudley Castle and the Merry Hill Shopping Centre in Brierley Hill. And in April, 2009, builders at West Midland Safari Park were stunned to see a UFO floating right above them. Market trader Michele Bardsley filmed mysterious lights over her home in Kingshurst, Solihull in May 2014. She said the lights were “just hanging there” as she watched from the back door of her house while having a cigarette break. She filmed the lights on her phone and, when the footage was shown on her big TV screen, she could see much more activity among the cluster of UFOs, as some appeared, disappeared and suddenly zoomed. And in 2012 an off-duty police officer claimed he witnessed a UFO speeding across the sky near Birmingham Airport. The figures, from a Freedom of Information Act request, were originally published on West Midlands Police’s website and covered the years 2013 to 2016.